In a heavy medium saucepan, bring wine and vinegar to boiling; reduce heat. Simmer, uncovered, until liquid is reduced to 1 cup (this should take about 15 minutes). Stir in whipping cream, Brie, garlic, sprig of thyme and basil. Cook and stir about 8 minutes, or until Brie melts. Set a fine mesh strainer over a large bowl. Carefully pour soup through the strainer. Season soup to taste with salt and white pepper. Serve in bowls topped with additional snipped basil and/or thyme. Serve with bread slices. 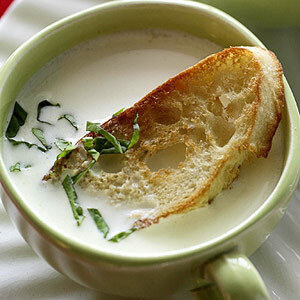 Brie Fondue: For fondue, prepare as directed except increase the white wine vinegar to 1 cup. Whisk 1/4 cup all-purpose flour into the whipping cream before adding to vinegar mixture. Cook and stir until cheese is melted and mixture is thickened. Sprinkle with additional snipped basil and/or thyme. Serve with bread cubes and/or dippers. Makes 8 appetizer servings.